The great poets were arguably at their best when they were angry or depressed: Keats, Tennyson, Coleridge, Hardy - the numbers are seemingly inexhaustible. And so it is, very often, with art. What a sunny thought. Somehow, you can’t imagine Van Gogh, Munch, or Kirchner and a whole hosts of artists being inspired by how content they are with life. To be at their stunning best, they needed something to rebel against - even if it was just themselves. Yes, dissension is a great medium for creativity, as a new London exhibition at the V&A, Disobedient Objects, demonstrates. What’s in the Disobedient Objects exhibition? The display is the first one to explore the easily overlooked part of objects used in social change campaigns. They range from video games with a political bent, blockades and barricades, textiles which have borne witness to militant killings, protest robots, politically-motivated defaced currency, woven banners, and even teapots. 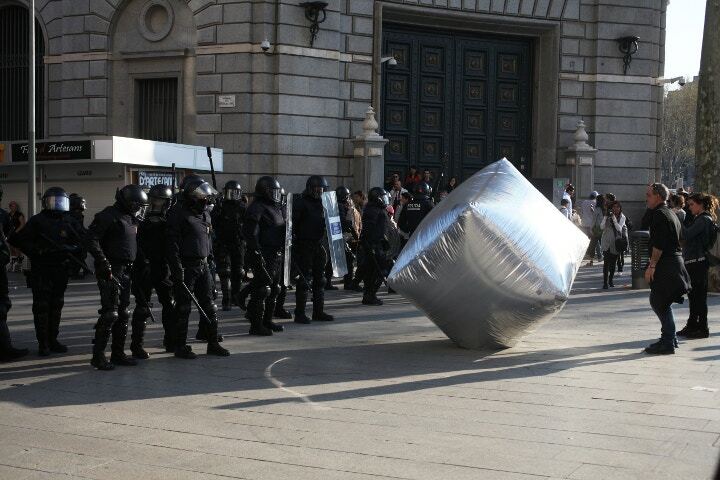 One artistic treasure among protestors is the inflatable cobblestone employed by the Spanish collectives of Enmedio and Eclectic Electric, during the 2012 General Strike in Barcelona. The thought-provoking collection is occasionally humorous, intermittently uplifting, and sometimes sad. It primarily focuses on the immense strength of creativity with grassroots crusades calling for political change, including innovations - plus enhancements - of existing technology. The objects being shown have been borrowed from a number of activist groups from across the globe, including Greenpeace. China, Canada, Spain, Ukraine, Russia and England are among the countries that have leant protest items, and the collection has thrown up fascinating challenges for the museum’s technicians, conservators and curators alike. As this exhibition demonstrates, protestors all around the world find an expression to air their grievances, whether that's through blockades, riots, or even killings. There’s a delicious, unique Englishness, however, about the “votes for women” movement in the late 1800s and early 1900s at this show: suffragette teapots. That's right: a revolution built on a cuppa. Disobedient Objects will be showing at the Victoria & Albert Museum until 1st February.